Trade Unions (often just called Unions) are organisations that protect the rights of workers in their jobs. Industrial Relations is all about how the workers and the managers get along. In this section, we'll look at what Trade Unions do for their members and also what can happen when the workers and the managers fall out. There are loads of different Trade Unions and workers in nearly every different type of job can join a union. Workers pay a monthly fee to become a member of a union and in return they will get help if they ever have any problems at work, like with their pay or being made redundant. Each union has people who listen to the members' views and opinions at Union Meetings. 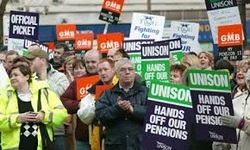 These people are called Union Reps (short for 'representatives'). The 'rep' then speaks with the management to try and sort the situation out. This saves having a hundred people all banging on the boss's door! Sometimes the workers and the management of a company fall out. For example, the workers might want a £100 payrise, but the management will only give them a £50 payrise. Sit-in: This is when the workers turn up for work but refuse to do any work. Boycott: The workers decide not to do a certain part of their job. Work to Rule: The workers decide to only do the work that they have to do, but nothing extra. Overtime Ban: The workers decide that they will not help the company out by doing any overtime. Strike: The workers decide not to go into work at all. The workers will not get paid for the days that they are on strike, but the company also will not have anybody to do the work! This is a last resort for everybody, but it is sometimes necessary so that the workers get their point across. It's important to note that workers can only do any of the above if their Union says they can. For example, if a worker who wasn't in a Union just went on strike, they could be sacked straight away. Sometimes the union and the management just don't seem to be able to agree. Even when the workers have been on strike, which nobody really wants, it can sometimes be the case that both sides cannot agree. When this happens, the union and the managers can ask for ACAS to get involved. ACAS stands for the 'Advisory, Conciliation and Arbitration Service'. They sit down with both sides and try to make them come to an agreement that will resolve matters. It might end up being an agreement that nobody is totally happy with, but at least it gets the workers back doing their jobs and it means the company can start earning money again.